Agnès Varda is one of the underappreciated voices of the French New Wave. Although arguably Wes Anderson must be a fan because he frequently rips off the flat graphic style she utilized in the opening scene of Cléo from 5 to 7, she is rarely spoken of in the same breath with the bigger "names" of the movement. Not even in discussions of the work of her husband Jacques Demy. But then again, while both of them value a certain amount of playfulness, they are dramatically different filmmakers. Demy concocted elaborate fantasias and musicals, and Varda sticks largely to realistic storytelling, sometimes making documentaries and even frequently shattering the "reality" of her fictions by letting the fact that she is standing on the other side of the lens with a crew inform how a scene is played. 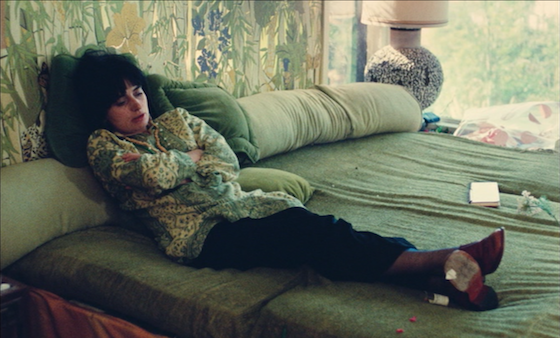 The new Eclipse collection from Criterion highlights two periods when Varda was away from home, living in California. The first period is the late '60s, which began when Demy went to Hollywood to make Model Shop and the family just stayed in Los Angeles for a few years afterward. The second period was around a decade later, after a documentary project fell through and Varda was separated from Demy. The five films in the set include fiction and non-fiction, sometimes intermingled, and they range in tone from wildly joyful to sedate and melancholy. The alien landscape of Los Angeles provides both a wonderland to explore and an unrelenting anonymous sprawl. For Varda, one of the filmmakers most able to translate her emotions and experiences into her work, this set is like a particularly engrossing diary. The set starts with a charming 19-minute portrait of Jean Varda, a septuagenarian artist living in a houseboat among the aquatically inclined hippies of Sausalito. Looking for a "rich American uncle," Agnès fails on three counts: Jean failed to sock away any significant cash, he is a naturalized immigrant from Greece via France, and he is actually her first cousin once removed. Jean says that Agnès can call him her uncle anyway. Varda (the filmmaker) is at her playful best, blending some self-consciously staged interactions (she includes multiple takes of her and Jean's "first meeting") into more naturalistic footage of Jean in his natural habitat, working and playing with his bohemian neighbors, all of them decades younger than him but delighted to have this free spirit around as a kind of community patriarch. A freewheeling and fun little flick. 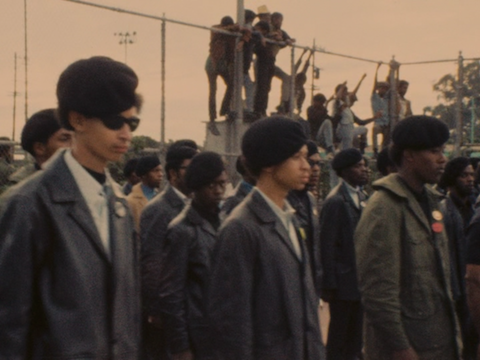 The next documentary short presented is dramatically different from the previous, with Varda turning her camera on a Black Panther Party rally, in support of jailed leader Huey P. Newton. Notable Party members like Stokely Carmichael, Kathleen Cleaver, and Newton describe the goals and struggles of the movement to improve living conditions in black communities and to prevail over oppression from police and the society at large. Varda attempts a journalistic tone here, but is clearly sympathetic to the Black Panthers, framing their pleas for members to take up arms and chants of "Off the pigs!" within the context of a group of people responding to decades of systemic racism. It's a interesting document of a time and place, with a mild aftertaste of agitprop. An artsy fartsy middle finger to the Hollywood system that refused to play ball with Varda, Lions Love is a consistently interesting but only fitfully entertaining and inspired mess. Warhol superstar Viva and the creators of the musical Hair, James Rado and Gerome Ragni, play variations of themselves in this amorphous brainstorm on love, stardom, art, the collapse of '60s idealism, and, like, "L.A.", man. Unseen choirs sing about streets named after dead movie stars and random objects in a living room. Three-way lovers Viva, Jim, and Gerry waste away a morning in bed trying to get one of the others to get up and make coffee. Later, they try parenting other people's children to see if they would be good at it, and end up giving the rambunctious brats sedatives. Fellow New Yorker Shirley Clarke (director of the recently reissued Portrait of Jason and The Connection) comes to stay, while she preps for a meeting with a studio about doing a Hollywood project. If Clarke's status as a Varda stand-in isn't clear enough from the get-go, in a later fourth-wall-breaking moment, Clarke can't bring herself to do the action as prescribed, so Varda finishes the scene for her. After Robert Kennedy and Andy Warhol are both shot, our three leads find themselves glued to the TV for days on end. A side-trip to a movie memorabilia store is a punctuated by a Peter Bogdanovich cameo in which he "hides" his face from the camera with a copy of his book on John Ford. 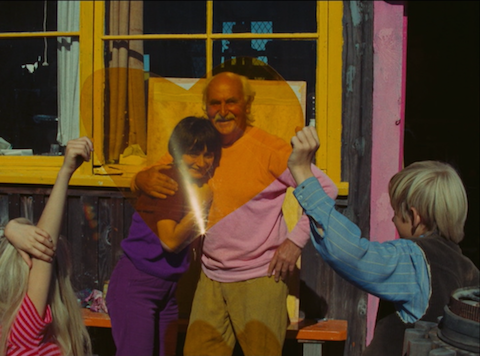 Eddie Constantine bungles a romantic improvisation with Viva, and Varda shows two takes of it. The whole crazy thing ends with a shot of Viva facing down the lens and breathing while Varda asks assistants offscreen how long the shot has been going on. It's hard to extrapolate a lot of meaning from it all, apart from the tortured cry of a creative personality reacting to the big and small injustices around her. I applaud Varda's experimental spirit but the film, running nearly two hours and feeling longer, could use a few less tangents. 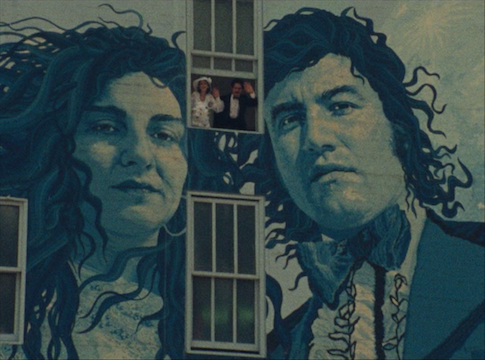 Varda can't resist a good pun, and the title of this documentary refers both to the French word for "walls" and the way that street murals "murmur" their messages to passersby. Mur Murs is a delightful survey of Los Angeles mural artists that shares the curiosity-driven approach of Varda's portrait of her neighborhood, Daguerrotypes, and also her better known trash-picker doc The Gleaners and I. Varda explores how murals offer a forum for artists to bypass the gallery system and get their work directly to the people. Black and Chicano artists discuss using these murals to create images for their own communities that are neglected and ignored by mainstream outlets. 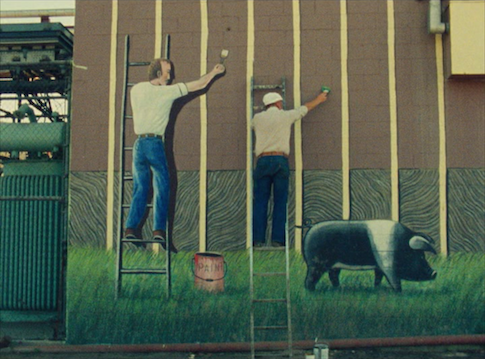 Varda also examines murals put up by businesses, including the giant wrap-around of the Farmer John pork processing plant, which took two artists twelve years to paint. Many of the artists express their religious beliefs in coded ways, such as a giant representation of the Holy Trinity and the Virgin Mary using photo-realistic images of obscure classic sitcom stars in modern dress. Varda lets her focus wander now and again onto other worthwhile tangents, such as a performance by Chicano punk rock band Los Illegals, the disorienting aftermath of a motorcycle accident, and an impromptu song from a passing elderly woman. 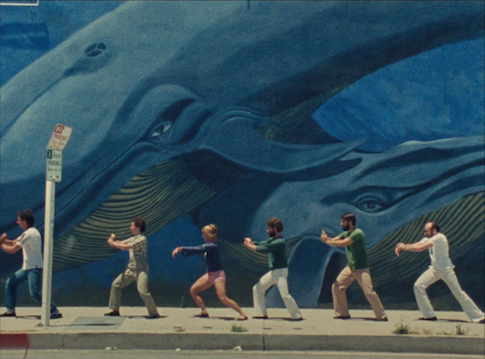 These elements contribute to the vibrance and vitality of this wonderful, idiosyncratic film. Subtitled "An Emotion Picture," Documenteur casts Varda's film editor Sabine Mamou (in her only film acting role) as a French woman in Los Angeles, coping with her new single mother status. Varda's then-eight-year-old son Mathieu Demy plays the kid, and he and Mamou create a convincing and moving onscreen team. Images and even some voice-over narration from Mur Murs pop up now and again, but the films are only tenuously related. The "documenteur" of the title does not refer to any documentary work and is actually a compound word of Varda's making, consisting of four maternal terms of endearment that don't exactly translate into English. Unsurprisingly, the storytelling is not centered strongly around a plot and instead focuses on tiny episodes, such as the boy's unwillingness to sleep alone, the mother's unspoken longing for her ex, and various trips to the beach. The lack of focus is mildly frustrating, but Varda so perfectly creates a melancholy mood and gets such truthful performances from her non-professional leads that the film is mostly captivating from beginning to end. Agnès Varda in California comes packaged on three DVDs. Lions Love has its own dedicated disc, while the other four films are presented as double features. Each disc comes with notes by Michael Koresky. Eclipse titles typically have not been given the same remastering as normal Criterion releases, but this collection is an exception. All five of these films were given 2K restoration jobs in the past few years, meaning that they look outstanding, even in standard definition. Lions Love and Documenteur are both presented in widescreen 1.66:1 transfers while the rest are presented in standard 1.37:1 transfers. The images are dirt free, with gorgeous saturated colors and rich black levels. Many of the films were shot with 16mm film, so they can get a bit grainy, but it's a satisfying, period-appropriate texture. All films feature Dolby 2.0 mono audio mixes and have been beautifully cleaned-up. Dialogue is consistently understandable and the occasional appearance of music and sound-designed atmosphere is well-blended. Black Panthers and Lions Love both feature English-language audio tracks with optional English SDH. The other three films feature both bilingual French and English audio or dubbed English audio options. However, only Mur Murs offers both optional English subtitles during the French passages and an English SDH track for the whole thing. The remaining two films only offer optional English subtitles during the French dialogue. An eclectic and beautifully realized set of films about life in Los Angeles from the French New Wave's unsung heroine. The feature Lions Love might be a little hard to sit through unaided by some of that California grass, but all five selections offer many pleasures, great and small. Thanks to the new restoration, they look and sound great too. Highly Recommended.